The snozzcumbers didn't sound very nice.I would recommend it to boys and girls.My favourite character was Sophie. A fantastic read! The Big Friendly Giant was my favourite character and I loved his word substitutes. I would defintley recommend this book to others. A brilliant book for people who love giants and nonsense. Roald Dahl is really creative and is really good at making up stories. I thought it was very scary at the start but i got used to it and it was very funny how the giant spoke gibberish . My rating is 5/5 . I liked the giants because they were funny. I really liked it because Sophie thought the BFG was a scary monster, but the BFG was a dream cacher and give peole really nice dreams. it was a fiction book and it was very good my favorite character was Sophie because she got kidnapped by a giant and she managed to make friends with so she is brave and friendly. yes I would recommend it to people in year 3 and under. This was a very emotional book but the book ended happy. 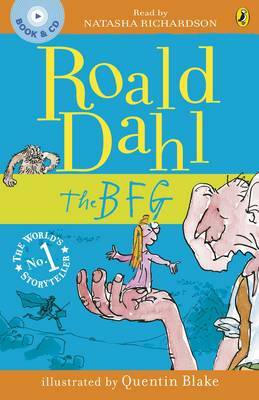 This story is fantasy.The BFG was my favourite character.I would not recommend it because I am to shy,but it is amazing. My favourite part is when Sophie and the BFG were whizz-popping! We did The BFG at School this year & I wanted to read the book but it's too hard for me so my Mummy read it to me each night at bedtime. I think it was amazing! I love Sophie as I wear glasses just like her, & the Queen is funny in the book. I like imagining what would be in The BFG's the dream jars & how heavy his case must be! You really should read this book with your Mummy's as its been LOTS of fun!